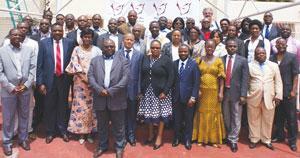 Representatives from Namibia ,Zambia and the DRC who attended the Tripartite meeting in Zambia. The 8th Walvis Bay Ndola Lubumbashi Development Corridor (WBNLDC) Tripartite Technical Committee meeting was held in Lusaka, Zambia earlier last month. Public and private sector senior officials from Namibia, Zambia, Democratic Republic of Congo (DRC) attended the meeting. At the meeting, technical experts identified possible solutions to increase the efficiencies of the WBNLDC in order to ensure the smooth movement of goods along the corridor, and as such increase cargo volumes. The corridor provides the shortest trade route between the Namibian port of Walvis Bay and the vital transport hubs of Livingstone, Lusaka and Ndola in Zambia, Lubumbashi (southern DRC), and Zimbabwe. This corridor is perfectly positioned to service the two way trade between southern African Development Community (SADC) region and Europe, North and South America and emerging markets in the far East. The corridor allows three to four days in transit to and from Lusaka, Harare and five to seven days into Lubumbashi. Amongst the issues discussed at the meeting were high transit charges among member states, congestion at border posts, customs bond, the issuing of 12 month visas to commercial drivers at border posts. As part of the solutions identified, the experts have agreed to ensure a confirmed commitment to address and reduce bottlenecks along the entire WBNLDC corridor by 50% by June 2017. They have also agreed to establish a permanent secretariat of the WBNLDC by June 2107 as well as initiated the spatial development initiative along the corridor by June 2016. In addition, the meeting agreed to establish working groups at Wenela/Katima Mulilo border post between Zambia and Namibia and Kasumbalesa border post between Zambia and DRC. The working groups will be addressing challenges being faced by the users of the borders for smooth movement of cargo and people. The DRC is currently the only country that has ratified the WBNLDC Tripartite Agreement. Both the Namibian and Zambian governments have been urged to ratify the agreement before August this year. The agreed resolutions will be presented to the committee of Permanent Secretaries and Ministers in August 2015 in Walvis Bay for endorsements. The Walvis Bay Corridor Group (WBCG) has a branch office in Lusaka, since 2005 to support its business development drive in the Zambian market and to provide quicker access to local service providers in the logistics industry who are interested in utilizing the WBNLDC, including an additional branch office in Lubumbashi.